Two of the most popular photographs in last week’s post were the frog and the purple passion flower. 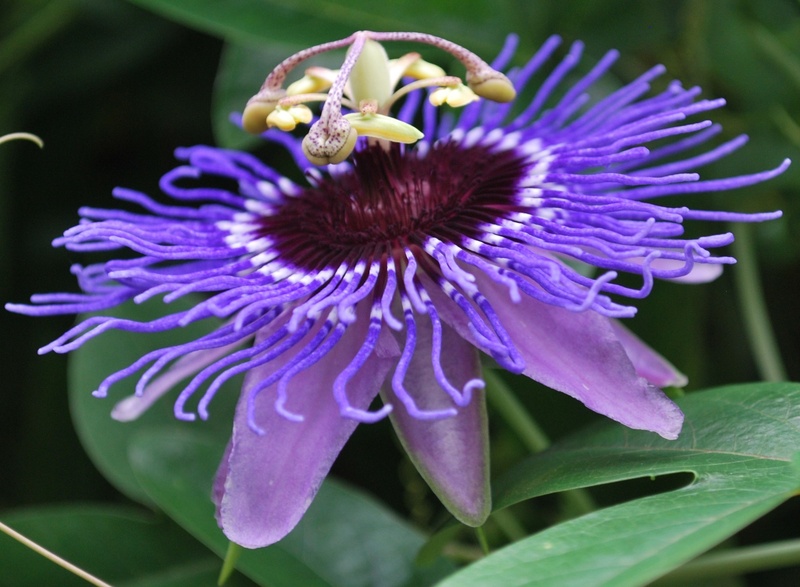 I was intrigued to learn from one of my readers that the passion flower got its name because its parts reflect the story of Christ’s crucifixion, (often referred to as Christ’s passion) including: the crown of thorns, the lashes Christ received, the three nails and the five sacred wounds, and 10 of Christ’s 12 disciples. If you Google passion flower’s name meaning/origin, you can end up falling down a rabbit hole, which is pretty much what happened to me. I’ll link you to Wikipedia’s discussion, which has an interesting range of information about the flower, its name and its history. In the late 1500s/early 1600s, Spanish priests found it in South America and gave it its religious name. They called it by a number of names, including “espina de Christo” (Christ’s thorn) and “La Flor de las cinco Llagas” (the flower with the five wounds). Priests used this flower to illustrate the the passion of Christ to their illiterate congregants. But passiflora or passion flower seems to be the name that has stuck. At least here in the Americas. A passion flower from the side – mesmerizing! In the late 1500s/early 1600s, priests used flowers and other elements of nature to teach the stories of the Bible to their congregants (many of whom couldn’t read). This flower became one of their methods for describing Christ’s crucifixion. Sources don’t completely agree on each element of the flower and its relation to the story, especially which 10 disciples the petals and sepals represent. Was it Judas (as betrayer) and Peter (as denier) who are left out? Or Judas and Thomas (all other 10 supposedly present at the crucifixion). Regardless of the details, it’s an intriguing way to help remember the passion story. Remember that rabbit hole I mentioned? 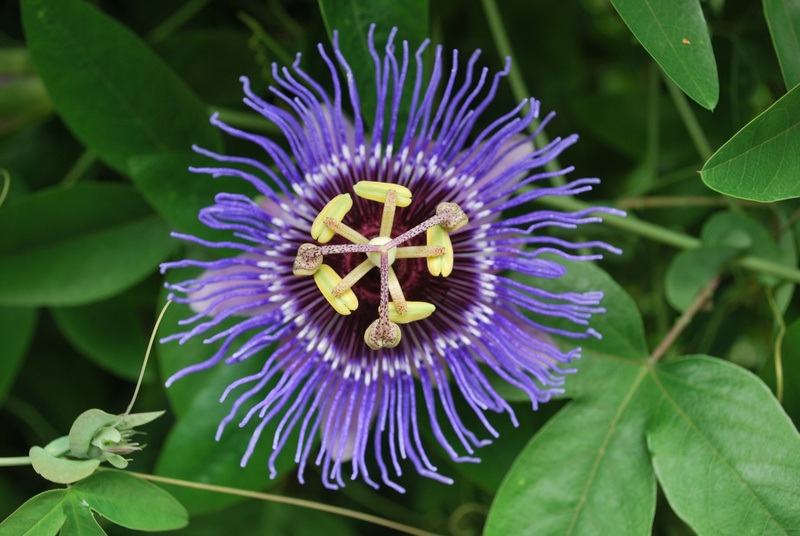 It turns out that the passion flower is a subject of intrigue in the art world. By the early 1600s, drawings of this flower had made their way back to Europe. But a painting of the Madonna and Child by Flemish painter Joos van Cleve (who died decades earlier, around 1540) shows Mary holding a carnation with a passion flower sprouting from it. The artist would have never seen the flower, much less a drawing of it, to include it in his painting. Thanks to modern art-sleuthing techniques, and the historical knowledge of when drawings of the flower arrived in Europe (as well as what those drawings looked like), we know now that some other artist added the passion flower as much as 150 years after van Cleve completed the painting. If you want to know more and enjoy seeing how the world of religion, art and nature collide in one mystery, here’s a great article to read. Because of all that I found about the passion flower, I visited my local arboretum again today to take new photos of the flowers. One site called them hypnotic, and I have to agree, especially those skinny tendrils that give them almost a sea-creature quality. For those of you who want to grow these in your own garden, here’s what I learned. Passion flowers have a short blooming season, and in the places where they grow well, they can take over. So be forewarned, and keep them cut back. Or plant them on a trellis or some other place where you don’t mind them climbing and growing abundantly. I finally found a sign for the flowers in this jumble of vines, but there were two types planted together, and so I don’t know if the ones I photographed are the “Purple Haze” variety or the “Monika Fischer” ones. 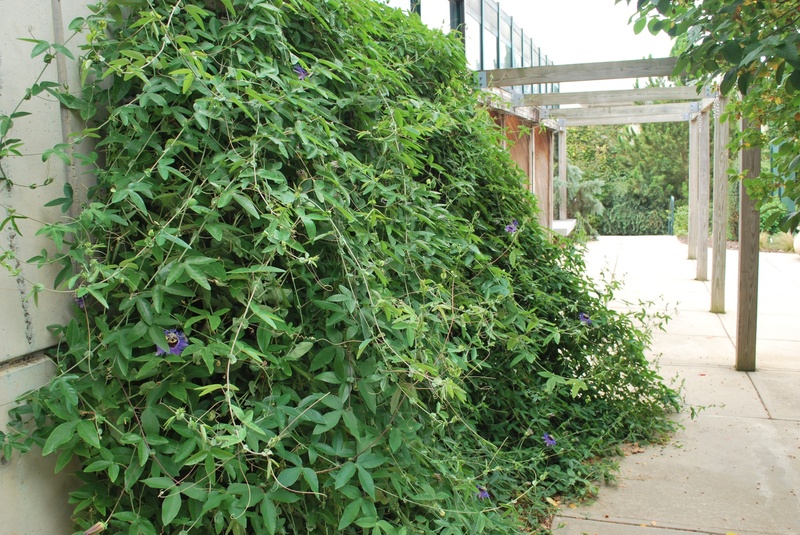 Passion flower vines will take over if you let them. I think I’ll take the risk and see if I can buy some to plant in my garden. They’re the most fascinating flower I’ve come across in a long time, and I think it’s worth the effort to see if I can get them to grow. How about you? 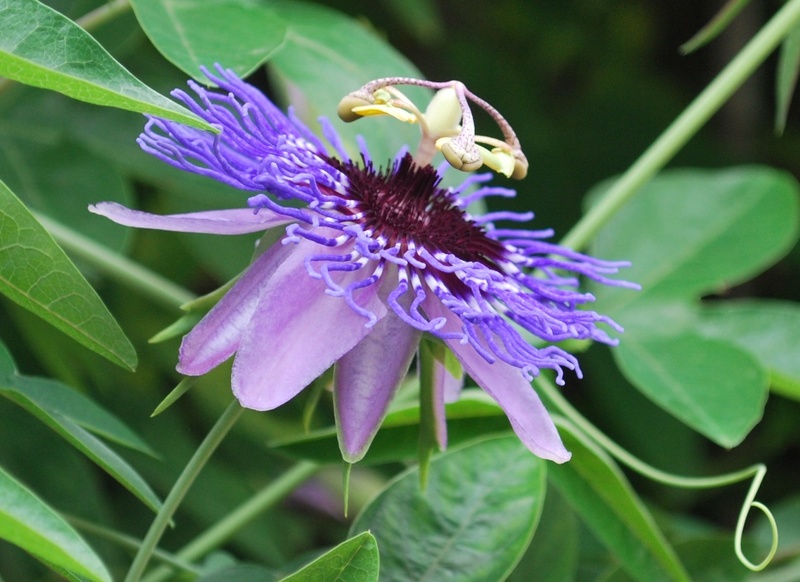 Do you already have passion flowers growing in your garden? Or have plans to look for them the next time you’re out shopping for plants? This entry was posted in flourishing tree and tagged arboretum, art, Christ, crucifixion, garden, nature, passion flower, photography, religion by hopesquires. Bookmark the permalink. 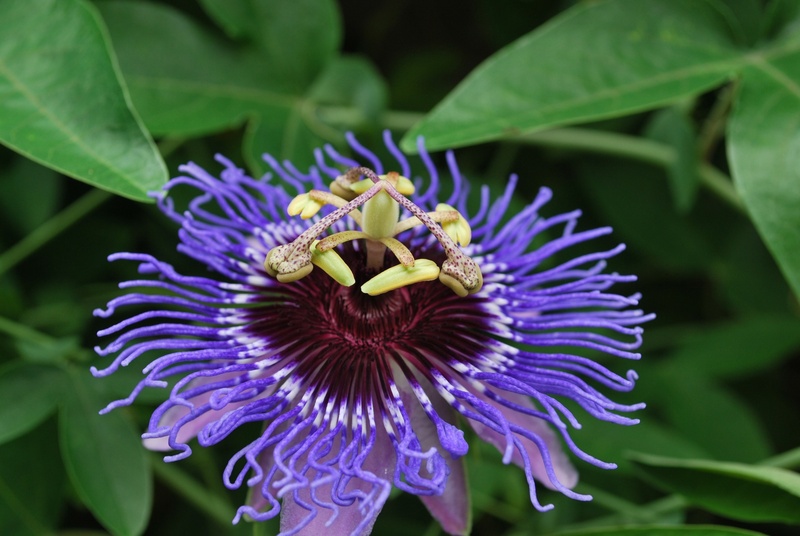 This is an older post so you probably alread have your passionflower vines and know what a beautiful monster they can be. I planted a single vine in a 5 gallon bucket situated near a post and short fence close to a blackberry hedge at the side of my main vegetable garden. By the end of the first year, it had grown out of the bucket and draped itself gracefully across the post/fence and over about 10 feet of grass all around. By the end of the second year it grew through the entire row of blackberry bushes, across the garden and into all my vegetable beds (AND up to the top of a 35′ tall tree in the other direction). After the third season, it killed the blackberries to the ground (which given the invasiveness of blackberries, I would have thought impossible), collapsed under its own weight and strangled a patch of pawpaw trees. I was finding new shoots coming up as far as 100′ from the original vine!!! I began digging and chopping like mad last year, but to no avail. Fortunately, this year’s record cold winter did what I — with my shovels and hoes — could not. The vines prove intolerant of severe and prolonged cold, apparently. We are in zones 6b to 7a and never protected them, but sub-zero temps for several months in 2013-14 were too much for it. It is now 1 May 2014 and not a vine sprout in sight. Thank goodness! They were beautiful, but not so much that I wanted to sacrifice my entire garden to them. Yours is a typical story I heard about the invasiveness and durability of passion flower vines, and they were enough to dissuade me from ever planting any. Blackberries are so tough. I can only imagine your surprise at seeing them killed. I’m glad to hear some positive news about the cold winter helping you take back your garden. Thanks for the cautionary tale to me and my readers. This post may be old but still gets plenty of visits. Maybe your response will save others’ gardens, too. I love my purple passion vine! In an effort to try and keep it in a small area, I buried a plastic pipe about 18″ down in the ground and then planted it in there…it contained it for about 2yrs. I now have it growing in other areas of the flower bed, but not near what it would have been had I not. Before moving it to our new house, I watched it take over an entire flower bed and even out into the grass! It is truly an intriguing flower! Wow, Beth! Thanks so much for the great gardening tip. I never would have though of a plastic pipe to contain it, but that makes so much sense. Did it thrive at your new house, too?